The KRB Shearline represents the most advanced rebar shearing system in the world. Designed to maximize customer productivity and operator safety, you will save time, reduce labor costs and increase production when shearing reinforcing steel bars. Because of the modular design, we can tailor a product that will increase your production and profits for years to come. 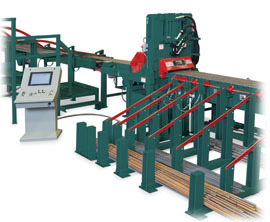 The KRB Shearline is the backbone of a highly efficient "Compact Rebar Shop." Combined with a production software system and other automated equipment, high production and yield rates can be realized when most of your steel can be processed automatically from stock to truckload.